Since Hollow's holes appear in different places, perhaps they appear where what bound them first to earth, IE caused their pain, was. So One in the chest is emotional, one in the head is thought related etc. I am sure it can be broken down further. 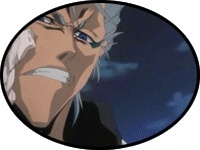 I also think that the position of the hole on the espada is their level of strength. I have no real evidence to lay claim to this, just noticing that Ulq is the highest rank seen so far, and I believe his being in his neck is the highest body part with a hole. Don't they change places when they release, too? I believe they might shift but so does their anatomy. My theory has a hole too, I mean did Grimmjow die of Indigestion or is the hole also related to a chakra? If their anatomy changes so would the location of their Chakras hence why they move. I don't think it has anything to do with power though, because then a lot more Hollow would equal Grimmjow, since the average place is in the chest or stomach, so the heart or chemical chakras. Actually, Ulquiorra's hole moving up to his throat out of his upper chest region is support for this theorum because it moved out of a no chakra zone and into a chakrarific area. I don't think it's that specific, and I was only referring to the level of power or rank in the espada. Also, I believe a NORMAL hollow's hole is in its chest. So anyone that's not particularly special would probably have a generic place as well. The only ones I remember are Grimmjow's abdomen, Ulqu's Neck, and Stark is right beneath that with one in his sternum or just below the remnant of his mask. Even if I guess Yammy's is in his chest, he and that fishbowl head are weakest, so that doesnt' really surprise me. If Nnoitara's is somewhere between the sternum and abdomen, I'll look into it more. It probably isn't that specific. It might be "Ooh the dot looks real cool there yo... dude... yah", but my theorum is badass!